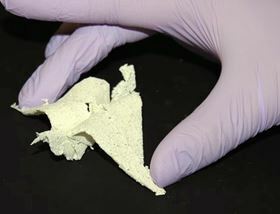 An accidental spill of some 3D printer ink has led to the invention of a range of bioactive "tissue papers" made of materials structural proteins excreted by living cells that are thin and flexible enough to be folded like an origami square. The proteins combined with flexible polymers could find use in bioactive dressings for the promotion of wound healing or as hormone stimulation agents for young cancer patients. "This new class of biomaterials has potential for tissue engineering and regenerative medicine as well as drug discovery and therapeutics," Shah explains. "It's versatile and surgically friendly." Shah suggests that for wound healing applications, the material might be useful in providing not only support of damaged tissue but promote the requisite cell signaling for regeneration. The hope is that the tissue paper materials would accelerate healing and preclude scarring. It was an accidental spill of 3D printing ink in Shah's lab by team member Adam Jakus who was trying to make a 3D printable ovary ink similar to the other 3D printable materials he had developed previously to repair and regenerate bone, muscle and nerve tissue. When he went to wipe up the spill, the ovary ink had formed a dry sheet. "When I tried to pick it up, it felt strong," Jakus said. "I knew right then I could make large amounts of bioactive material. The light bulb went on in my head. I could do this with other organs." The tissue papers are very much like sheets of standard office paper when dry. They can be stacked explains Adam Jakus or even folded into 3D objects. "Even when wet, the tissue papers maintain their mechanical properties and can be rolled, folded, cut and sutured to tissue," he explains. Tests with tissue paper made from bovine ovary proteins have been used as a support for growing ovarian follicles and the associated hormone-producing cells in the laboratory. This could be useful as a way to restore hormone function in a young cancer patient following chemotherapy or radiotherapy where ovaries have been damaged irreparably. Other tests have shown that some of these tissue papers from a bovine source can support the growth of adult human stem cells. This is a good sign of biocompatibility, the team suggests. "It is really amazing that meat and animal by-products like a kidney, liver, heart and uterus can be transformed into paper-like biomaterials that can potentially regenerate and restore function to tissues and organs," Jakus said. "I'll never look at a steak or pork tenderloin the same way again."